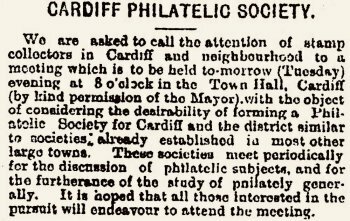 A Halfpenny Postal Stationery Card giving notice of the inaugural meeting of Cardiff Philatelic Society. 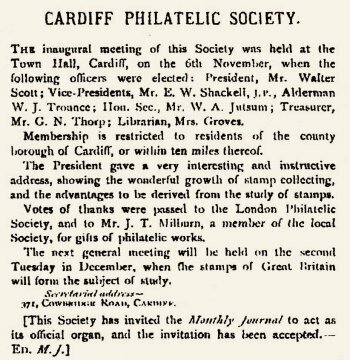 The Stanley Gibbons Monthly Journal 30th November 1899 reported that the inaugural meeting of Cardiff Philatelic Society was held in the Town Hall, Cardiff on 6th November where the President Mr Walter Scott “gave a very interesting and instructive address, showing the wonderful growth of stamp collecting, and the advantages to be derived from the study of stamps.” at this meeting W.A. Jutsum, the sender of the card, became Hon. Secretary.